Tensions rose at the CSU council meeting Wednesday night. Photo Brian Lapuz. 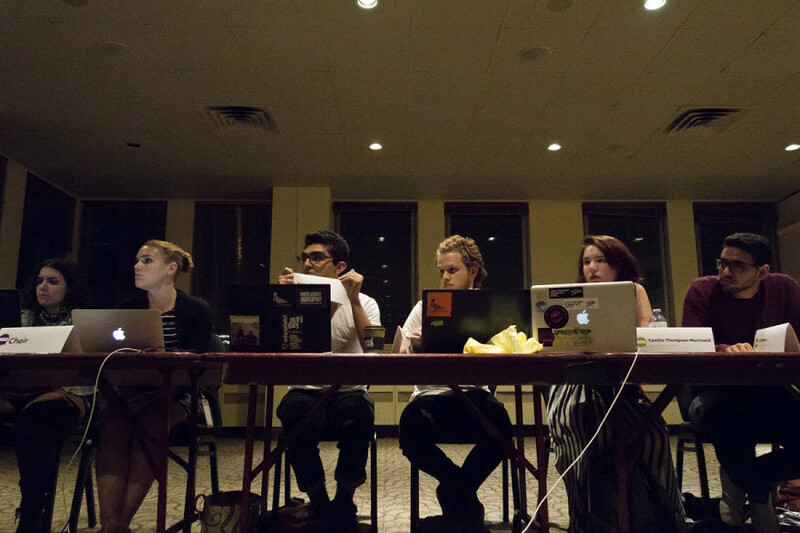 Tensions rose after Concordia Student Union council learned Wednesday night that General Coordinator Omar Riaz and Finance Coordinator Soulaymane El Alaoui charged more than $1,000 to the union’s credit card during a trip to B.C. this summer. Another point of contention, the trip itself was paid for by Lev Bukhman, CEO of the CSU’s insurance provider Alliance pour la Santé Étudiante au Québec. The union renewed a contract for health and dental insurance with ASEQ last year. Riaz and El Alaoui have been issued formal warnings, and asked by CSU council to publicly apologize for what is seen as a conflict of interest. The pair had also tried to file $980 in trip expenses, including nearly $800 in car rentals, under the Health and Dental Plan Premiums budget line. Gaudet later explained that the cheques were not signed. As signing officer, he did not sign them, so the CSU did not actually lose this money. According to El Alaoui, Bukhman paid for their plane tickets so they could attend a Student Union Development Summit, and also bought them dinner. The exact cost of the tickets is unknown, though Gaudet has heard that it could be over $2,000 total. Gaudet specified that this is not confirmed. Riaz and El Alaoui say they didn’t see this as a conflict of interest because they were not involved in the negotiations of the new ASEQ contract last year, and did not foresee themselves being involved with future ASEQ contract re-negotiations. Riaz stressed that this was not a personal trip. Riaz and El Alaoui arrived in Vancouver two days before the summit began in order to meet with the Alma Mater Society —the University of British Columbia’s Student Union —and ASEQ. According to them, the purpose of the trip was to observe how other student unions across the country function, in order to bring back new ideas to the CSU. “We saw an opportunity to improve some of the services that we had, and the conference was a good opportunity to not only look at how other schools are working but also to make those contact points,” El Alaoui explained in an interview. “So really it was with the best intentions for the students at heart, and it was to be able to bring points forward to council on what others are doing but also on what could be done to improve what we’re currently doing,” he continued. “Really it was with the best intentions for the students at heart, and it was to be able to bring points forward to council on what others are doing but also on what could be done to improve what we’re currently doing.” – Soulaymane El Alaoui. He added that the University of British Columbia has their ASEQ services in house, and that part of the reason they attended the trip was to see if this would be a viable option for Concordia students. In-house services allow students to ask questions about their health and dental plan in person, rather than having to rely on their call centre or website. El Alaoui explained that students have issues understanding ASEQ’s website and that this could clarify things for them, while also increasing student jobs on campus. Gaudet brought forward the motion that led to Riaz and El Alaoui’s formal warnings. He explained that the CSU executive were offered the same trip last year, but had turned it down. In reaction to this, the CSU adopted a position last February, stating that all executives must declare the gifts they receive in their monthly reports. The position also states that if executives are offered any benefits or gifts, the council will have final approval on whether those gifts can be accepted or not. Council agreed that not following the position could put an executive at risk of impeachment. Gaudet also said that Riaz should’ve been aware of this regulation, since he was a councillor when it was adopted. According to CSU Internal Affairs Coordinator Veronika Rydzewski and Student Life Coordinator Leyla Sutherland, Riaz and El Alaoui did not consult the team before accepting the trip. The executive team was informed before they left for Vancouver, but did not feel they had the option to tell them not to attend. Many CSU councillors had only found out about the trip this week, and only after El Alaoui and Riaz released a report about their time at the conference. There were also questions surrounding why they were the two executive members chosen. Despite the executive team denying prior knowledge of the trip, El Alaoui and Riaz said they were consulted and made the decision internally. Riaz explained that councillors were not informed of the trip or the funding behind it, because of “a complete oversight,” and that it was not done intentionally. Later, John Molson School of Business councillor Rory Blaisdell brought forward a second motion stating that Riaz and El Alaoui must issue a public apology to the entire student population. Council agreed that within this apology, Riaz and El Alaoui must explain the errors they made in this incident, and describe ways in which they plan to avoid another event like this in the future. They also have 90 days to provide a complete account of the benefits they received while there, and to pay the CSU back in full. Council also agreed that Riaz and El Alaoui can no longer negotiate with ASEQ. Upon more research, Gaudet also estimated that the registration fees for the summit itself must have totaled about $1,090. When asked where the funding for this came from, El Alaoui explained that it was charged directly to the CSU credit card. “We incurred those costs because we thought there was value to going to this conference,” said El Alaoui at the meeting. Several council members were also unhappy with the recommendations offered by Riaz and El Alaoui in the report they wrote after the summit. In their report, Riaz and El Alaoui drew comparisons between the CSU and other student unions. They explained that the other unions showed them that hierarchical structures with fewer executive members worked better. The original version of this story stated that Omar Riaz and Soulaymane El Alaoui would have to pay the the CEO of ASEQ Lev Bukhman back in full. They instead have to pay the CSU. The Link regrets the error.